So every now and then I get a wild hair to move things around and completely re-do the entire house. My mom says this started when I was about 10 years old, and she’d find me rearranging all the furniture in my room on a regular basis. And then I’d do the living room. I can still remember her and my dad telling me not to try moving furniture alone because I’d hurt myself. Weird? Possibly. But I’d say that’s just a girl who knew the value of freshening up decor from time to time, which explains why my home now is always evolving and changing. And maybe why I’m addicted to DIY projects. 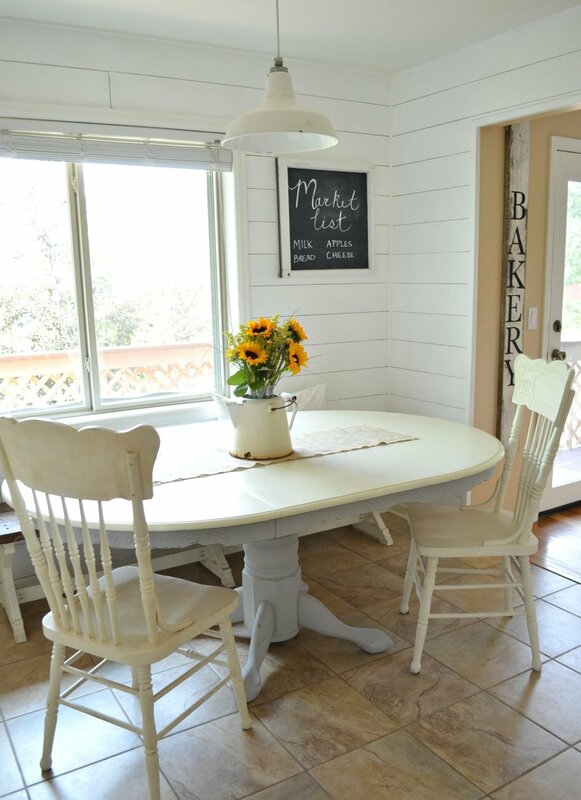 So it probably won’t surprise you that I’m back today with a little breakfast nook makeover. 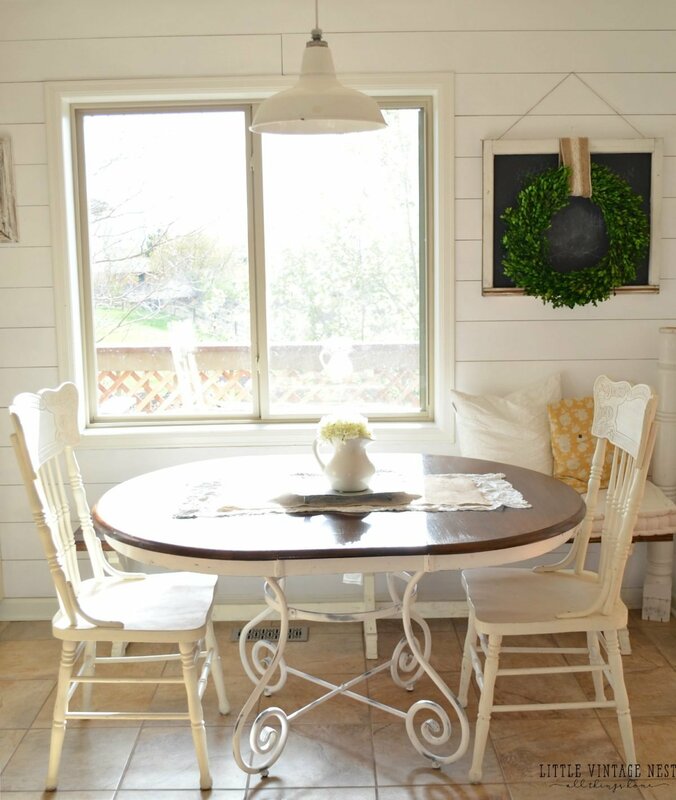 Well, actually it’s just a new dining table makeover, but it really feels like this space has new life with this swap. 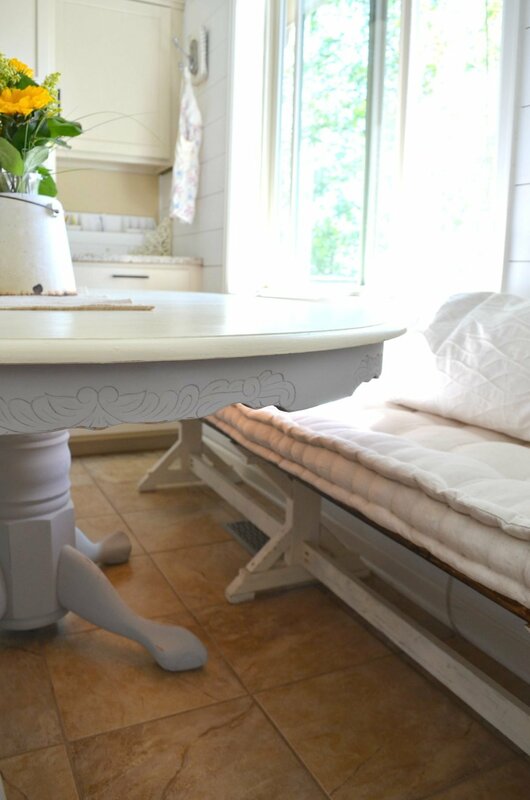 This is exactly what I envisioned for our breakfast nook all along: an antique, claw foot table. This baby is old and heavy. And it turns out this has been in our family for years, which always makes me happy. 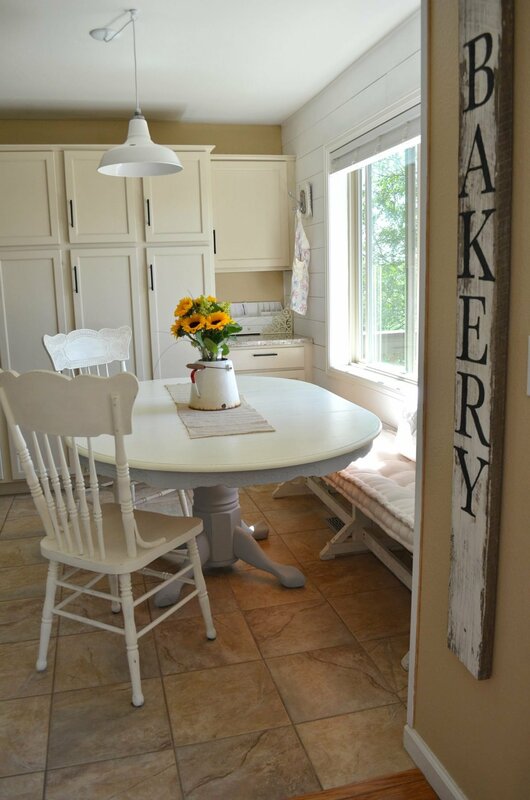 I used Annie Sloan chalk paint in Pure White on the top of the table and Paris Grey on the bottom (2 coats of each). Instead of using the Annie Sloan clear wax to seal the top of the table I tried out this clear Polycrylic protective finish. I honestly haven’t been loving the Annie Sloan wax finish on my vanities in our bathroom. It just doesn’t seal and protect from water damage like I was hoping. So we decided to try this instead and it actually worked just fine with the chalk paint. The little scrolling is my favorite part of the table. And I couldn’t help myself. I had to distress just a smidge to accentuate those details. This purdy bench cushion is from Pier 1. It’s perfect in this spot, but I’ll be honest–it’s never here at meal time. Ever. Because white cushions and kids don’t go well together. I was happily surprised to see how well these chairs, which were a free findon Craigslist, match the table with that scrolling and detail on the side. I love when that happens! Honestly, this is my favorite kind of DIY project. I love taking an old piece of furniture and breathing new life into it with a bit of chalk paint and TLC. And although my husband thought I was a little crazy to replace our perfectly good table, even he is loving this change. It just seems to fit so much better with our decor. Plus I already sold the other table, which means it literally cost me nothing to freshen this space up. That’s winning my friends. So that’s my chalk paint table makeover. Let me know what you think and be sure to track me down on all those social media things. Instagram.Facebook.Pinterest. Thanks Susanne! 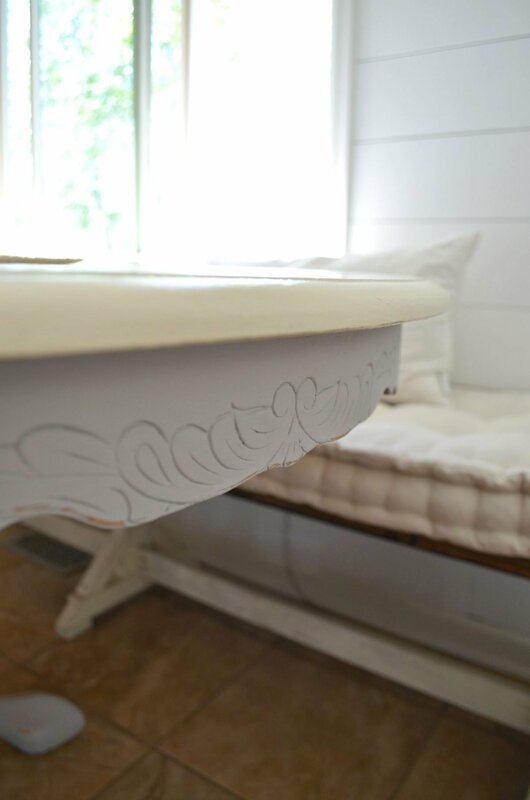 I loe claw foot tables too, they’re so dreamy. Good luck refinishing the bottom of your table! I was wondering where you got your Annie Sloan chalk paint. I can only find it in the quart size. Nope, just went straight in with the chalk paint! If you were to sand the top of the table, would you recommend doing so by hand or getting an electric sander? Oh you can totally do that by hand! I’ve got a table sitting in my garage as well screaming for me to give it new life. You’re so sweet Joette! Thank you so much. And heck yes, get that table out of the garage and get to work girl! Wow! Love it! You sure didn’t waste any time! Love the grey and white combination! Thanks for sharing! Thanks so much Ann, I’m loving the grey and white combo too! Your table looks great! I love the color combo. I’m getting ready to paint our table, so thank you for the inspiration. So glad I found you on IG! Yay! So glad you found me too Tricia. Good luck painting your table! We used a basic paint brush to apply the polycrylic. We did 2 coats, sanding a little in between the two. I’d say maybe sand down the top to remove the wax a bit and then go in with the poly. Good luck! How does the table wash with the poly? 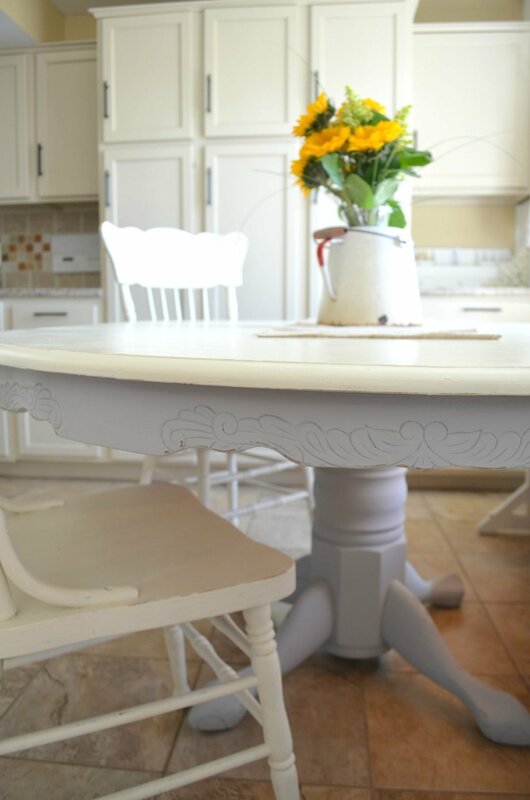 I love chalk paint and have planned to use it on my table but with kids am a little worried. It washes up really well! We are a couple years into using it almost every day now and it’s hoping up like a champ. I would love to see a pic of the table top now, after using the water based poly as the finish, and after exposure to sunlight. I fear yellowing. Love it! Great job!!! And this is how my mom describes me! Now in my own house I not only move furniture all the time but entire room switches!!! I can’t help it!!! Thanks so much Debbi, I really appreciate that! I simply love it. 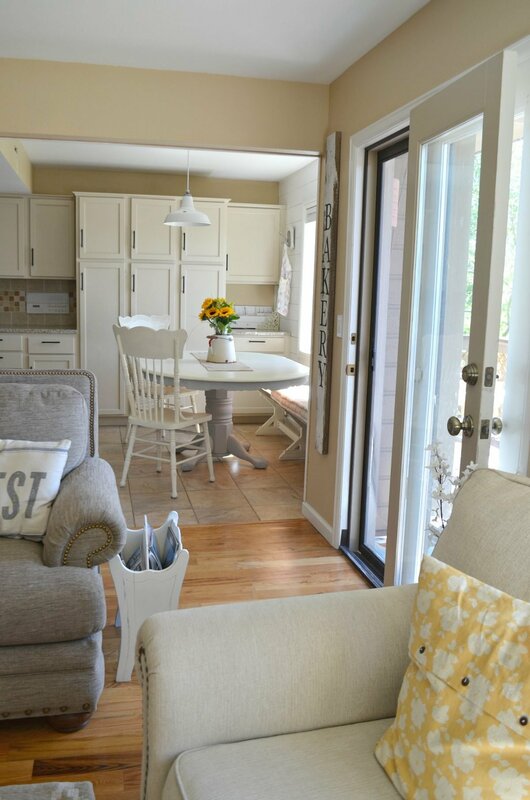 Paris Gray is a great color by Annie Sloan. I love the carving under the top. I would sand that a bit more to show how old and pretty it is. And if you ever tire of it, send it this way!!! Looks great! I just purchased almost the same table for $25 off Craigslist. I painted it all white:) I will use poly seal as well. I want it to hold up with wear and tear. Your table and chairs are perfect! Great job. Love your home! Can you tell me what you used to distress the grey part of the table? Thank you Alicia! I just used a piece of fine grit sand paper. Love how your table turned out!!! I just got a coffee table that is the exact miniature of your table and I have been wanting to chalk paint it white and know I’m excited to do it because I can see the end product and I love it!! I will take your advice too, with the poly, on other piece that I have that are chalk paint and waxed they don’t hold up as well and I definitely want something that is more wearable! Thank you, love your blog and all your DIY’s!!! Am planning to paint a similar oak table to stage a house we are preparing for sale. I usually brush the paint with the grain, but the top of this table — like yours — has a starburst pattern. Did you just brush in any direction? or did you use a roller for the tabletop? Thank you for the inspiration! Well done! Hi Ann! I brushed vertically on the top of the table. It took 2 coats, so no brush strokes show. And I just used a normal paint brush. Thanks for stopping by! Beautiful! What is the color on your living room wall…looks like a beige/tan/yellow? Thanks Erin. The color is Autumn Blonde by Sherwin Williams. Beautiful work. What kind of paint did you use for the chairs? I have one that is the same but I want to spruce it up. 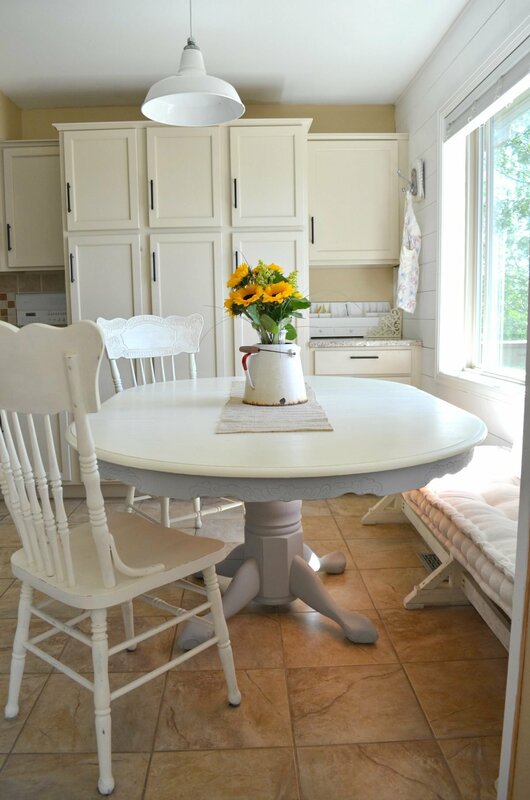 Those chairs were painted with Annie Sloan Old White. Did you seal the chairs as well? Wax? Or leave with just the paint? I did Emma, I used Clear Annie Sloan Wax on the chairs. I am in the process of redoing my dining room table with chalk paint – I was going to wax, but I just read your piece about the polycrylic. Did you use multiple coats of the polycrylic and if so, how long inbetween coats? Also, do you apply with a regular paint brush? Thanks! We used 2 coats, but I might add one more down the road. We used a normal paint brush to apply it. We sanded lightly with steel wool between coats and waited about an hour I think before applying another coat. Good luck with your table! Hi there, I was just wondering if you sanded the entire table before applying the chalk paint? 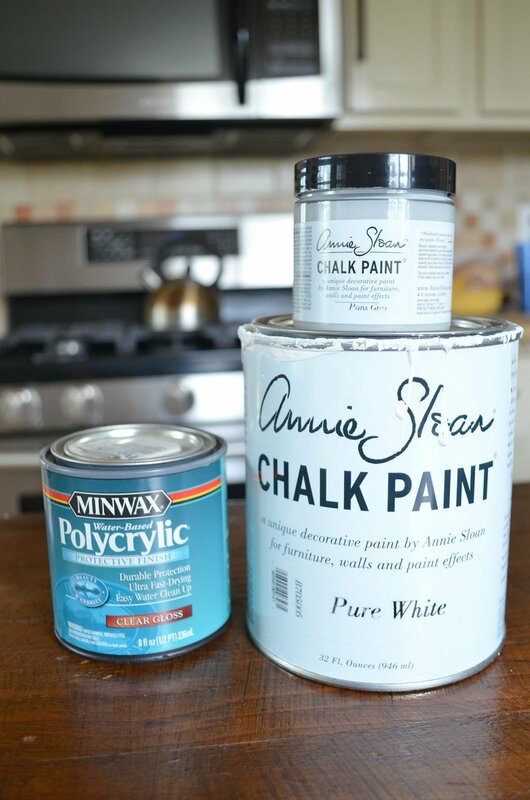 I have read mixed things about whether or not one must sand the furniture prior to using chalk paint specifically. Nope, I didn’t sand it at all. Sometimes not sanding can cause an issue with the paint adhering to the wood, but I’ve never had that experience. It always works fine. But you can always sand the top down a bit just to be safe. Love your table! I’ve been wanting to do something similar with our old oak table. I’m wondering how does your beautiful table stand up to daily use with small kids? Eating. Coloring. Etc. I have a 3, 1 and one on the way. I think I saw you have littles? Thanks! P.S. Just found your site and am really enjoying it. We live in a little limestone house built in 1852! Great question Morgan! It is holding up REALLY well with the kiddos coloring on it, drawing on it, and banging on it all the time. My daughter even got nail polish on the top and it came right off with nail polish remover and no damage to the table. Definitely use that polycrclic to finish it off and NOT wax. I used just wax on our bathroom vanities and it’s not holding up well at all. I have the exact table that I’m looking to revive with a new look. 🙂 Did you have to remove the varnish from the table before painting? Nope! 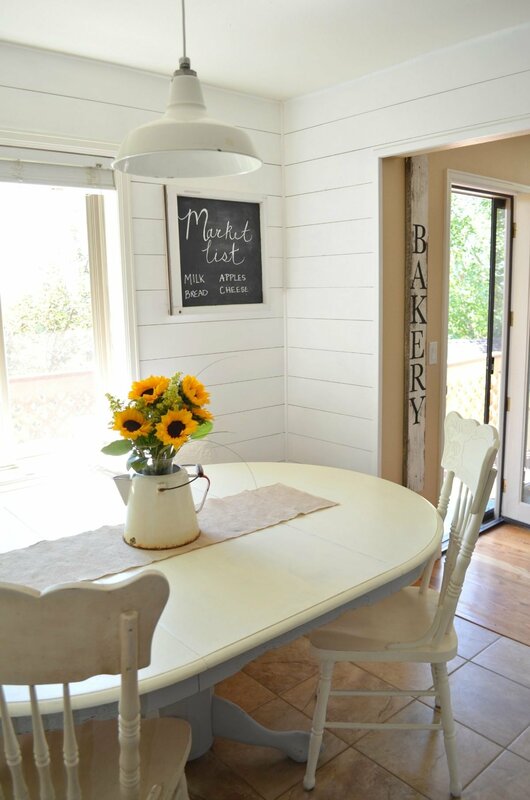 Not with the chalk paint, you can paint right over it. Sarah I love your table tutorial. It is very informative and the polycrylic is going to be the way I go when I refinish our table. Thank you for the simple and easy to follow directions. Be blessed!! So glad you enjoyed the post Michele! And thanks for dropping by! I have a table almost identical to yours and have been wanting to paint it for the last year! It’s going to happen asap after seeing your pics! Thanks for the inspiration! 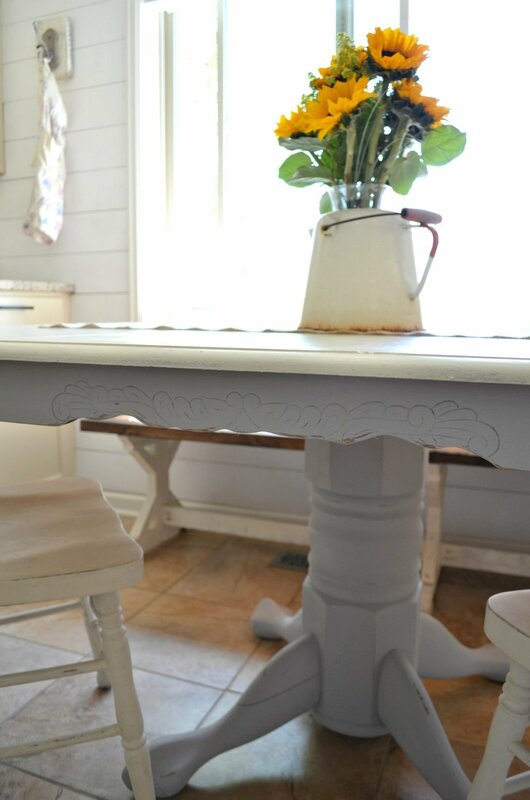 I painted my dining table using Annie Sloan Pure White chalk paint. The first time I used polyurethane for top coat and it yellowed! Needless to say I sanded the whole table down and started again. I keep researching and I am not sure what to use to avoid that yellowing appearance. I see you used the polycrylic. I read elsewhere that can also produce a yellow appearance on light colors. I did not see any mention of any color change in your blog. So my question is that, have you experienced or seen this to be true? Hi Betsy, I haven’t seen any yellowing yet on that table. I’m not really sure why, but thankfully it hasn’t happened for me yet. Sorry that happened to you, what a huge pain to sand it down and start again! Polyacrylic has two varieties one may yellow the other does not (Check with the sales people at your paint store) . I ran into that when we were refurbishing our cupboards in a former kitchen Unfortunately we had to sand, repaint and re apply the non yellowing variety on the affected doors. Me too! Working on a kitchen cupboard project-chalked them all and then applied polycrylic after much research (decided against wax) only to have it yellow!? Sanded it all down and started over. Still searching for a topcoat….anyone try the Rustoleum topcoat? Hi Sarah. Your table looks beautiful by the way though I have a question relating more to the table itself. In your post you mentioned that you obtained the table from your aunt’s garage sale. I have the identical table and have been painfully trying to identify and obtain a value for the table before I sell it but have not been able to do so. However I have seen numerous posts on Pinterest where people have refinished the table so I am going down the list and one-by-one trying to see if anyone has information on the table itself. I wasn’t sure if it was antique or vintage? The legs are that of a sleeping cobra and the only identification mine has is way under the table top there’s a stamp in Japanese which I had translated to mean “table for many people.” This makes sense to me because I bought it from a friend almost 30 years ago who bought in Japan while stationed there. If you or your Aunt has any information on the table I would greatly appreciate it. Thank you! Oh wow Kellie, it sounds like you have an awesome table!! This done doesn’t have anything like that, so I can’t say what kind of value yours would have. But I regularly see these tables on Craigslist for anywhere from $100-$250 depending on the table. I paid $50 for this one because my cousin just wanted to get it gone! So my daughter is getting married and we have the table/chairs, but wonder how long of a project this might be? Table and 6 chairs, 2 layers chalk paint and acrylic top coat? Thx! 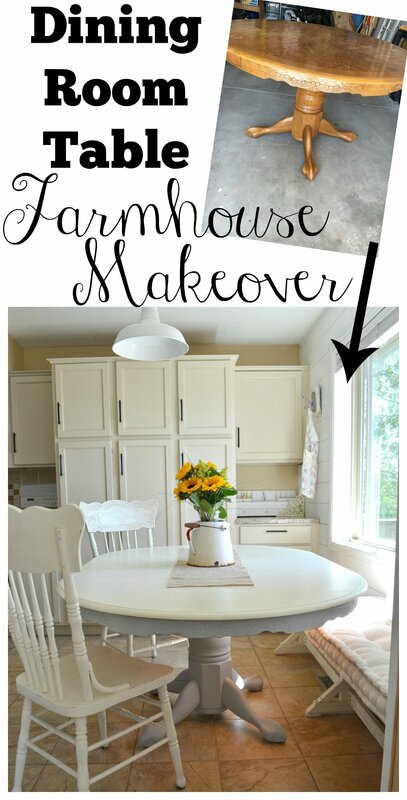 I love your farmhouse table. We just recently moved into a smaller house (retired and downsized). I have been painting furniture for years cuz I love the look. 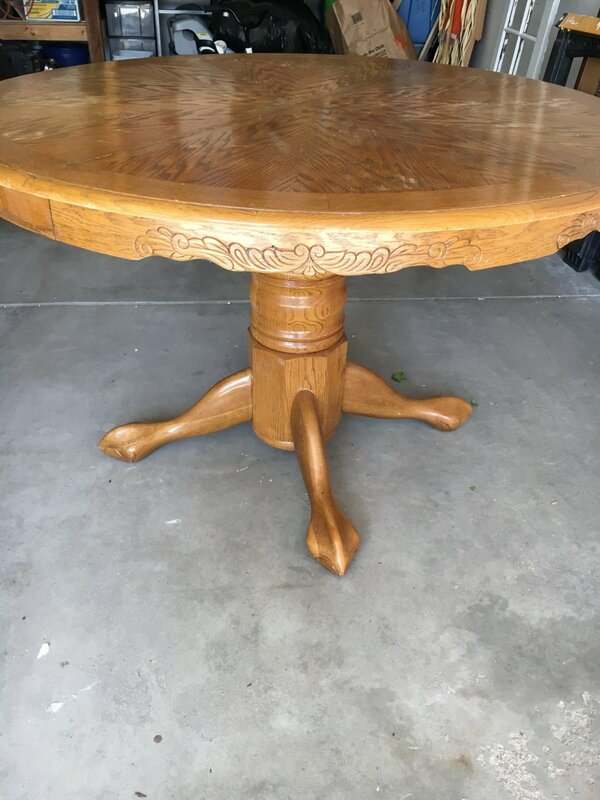 I had to get rid of my dining set cuz it was too big for our small space and ended up with my mother in laws round oak pedestal table which had lots of lacquer on top. I painted the bottom white and am using a dark stain on top as I like the look of the contrast. Having to sand it lots but am going to love the look when it’s done. Love your blogs.. I am getting ready to paint my table as well. I love the Annie Sloan chalk paints but just like you, I’m not a fan of the wax seal. I want to try the seal that you used but was wondering if your final product remained flat or did it shine it up. It was kind of hard to tell in the pics. I prefer a flat finish. I’m about to do my oak kitchen cupboards. 20 cupboards plus other oak panels and 4 drawers. I have never used chalk paint but really can’t afford Annie Sloan as I’m a pensioner with very little left over at the end of the month. I don’t want pure white but soft beige color. I also want to use a light black smidgen on the grooves of the inserted panels on the doors. 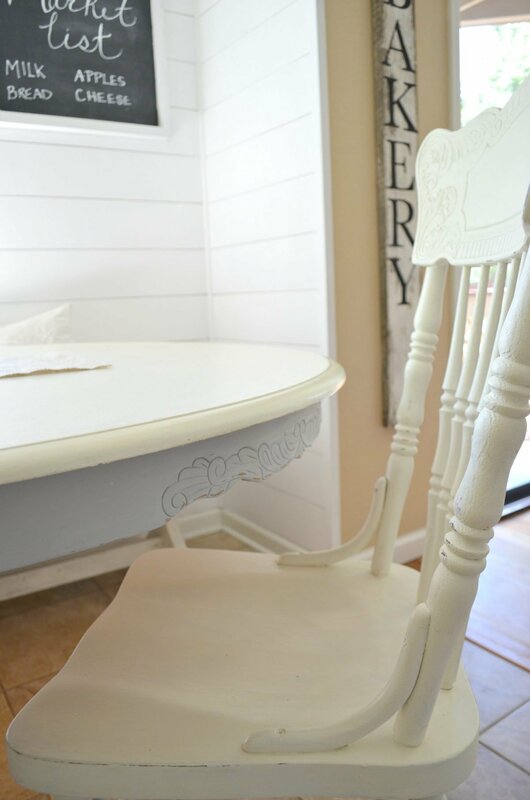 Do you truthfully think Home Depot Chalk Paint with Polycrylic top coat will do the trick. Should I use a sponge roller on the door panels and paint brush down the inserts. Want to do a good job but very nervous to get started. Or, should I bite the bullet and wait to purchase Annie Sloan. About how many cans would I need. Do you have any ideas. Just my opinion, but It’s sad that you had to ruin all that beautiful oak inlay with trashy paint. I have stripped a table top and want to paint it because the wood is quite strange. It has a wood grain, only in some places, that just cannot be sanded down and really does not accept the stain. It’s patchy and rough in places.I have stripped it down 3 times now and really do not want to do it again. I cannot fine Annie Sloan paint in Canada. Are they basically all the same or are some brands better than others? You would be fine with Rust-Oleum chalk paint or even the Magnolia Home chalk paint, which is now available at Target! Hi! I love your table! I’m about to redo a dining room table. It’ll be my first time using chalk paint. Thanks for the tip about not using wax but using polycrylic instead. I hope mine turns out looking as good as yours! I love this! It’s exactly what I’m planning with a table my in-laws have given us. Is it holding up well to stains etc? I just started my first chalk project ever… i chose Rustoleum because it was available at Home Depot….the fellow actually mixed a custom color from the Rustoleum paint sample cards Espresso I don’t know if he did it to help me out or if it is common ….painted on beautifully…sanding now love the experience….thank you for the help!! Your table looks wonderful! 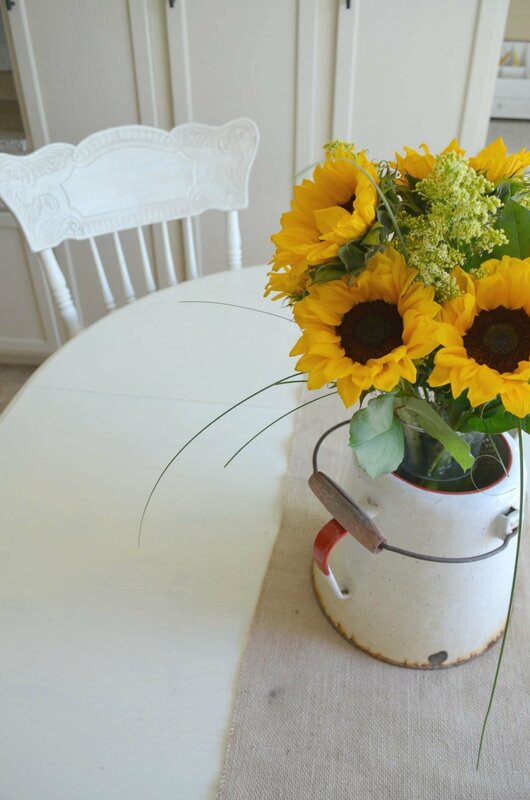 I am getting g ready to do the same project very soon, and was concerned about the best finish to hold up to the daily use of a kitchen table. So glad to hear the polycrylic is holding up well to cleaning and not yellowing, either. Do you happen to remember her what brand you used? Thanks!